We ran a very busy bar during the week of the annual Petersfield Music Festival. 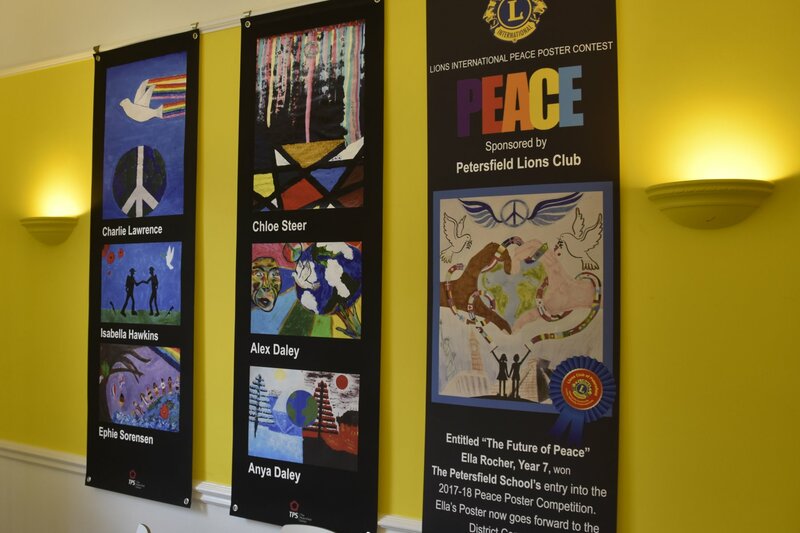 TPS Year 8 student Jemma Green who won the Petersfield Lions sponsored Peace Poster Competition this year, also won the District and subsequently the National Competition. 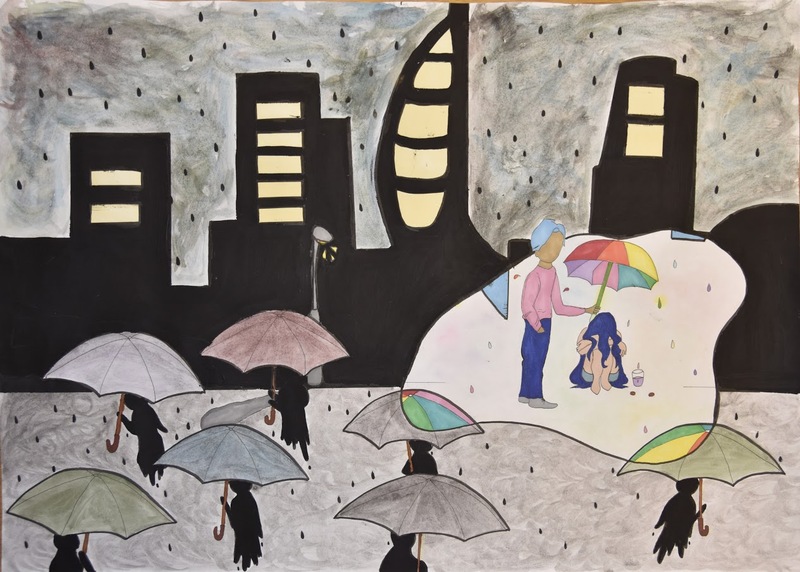 Jemma's interpretation of the theme 'Kindness Matters' was widely praised by TPS staff and Lions Club representatives from around the country. 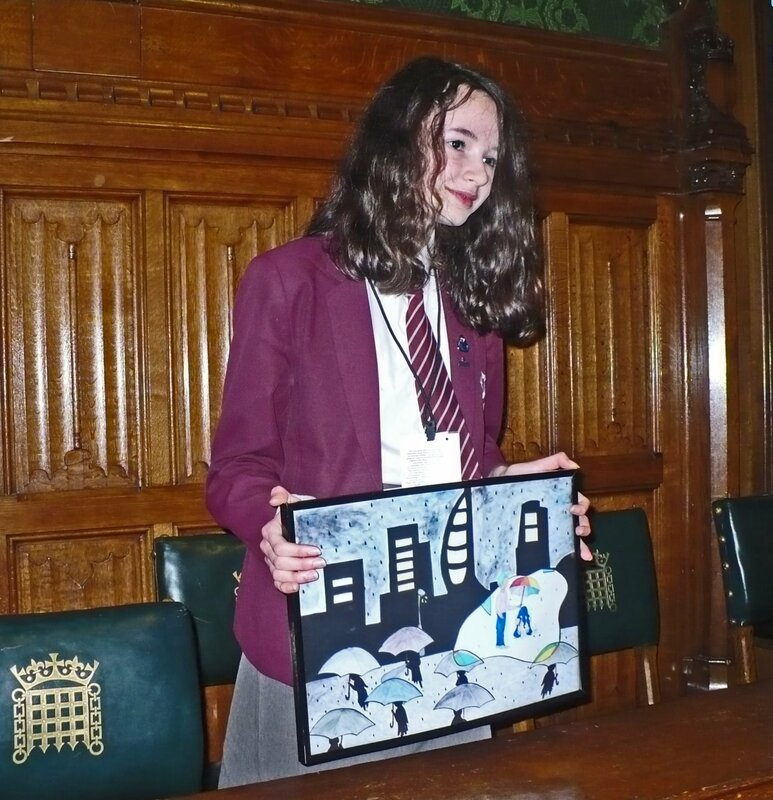 Jemma attended the Houses of Parliament in Westminster Palace at the Lions International UN Day, to be presented with a Certificate, cheque & framed copy of her picture. 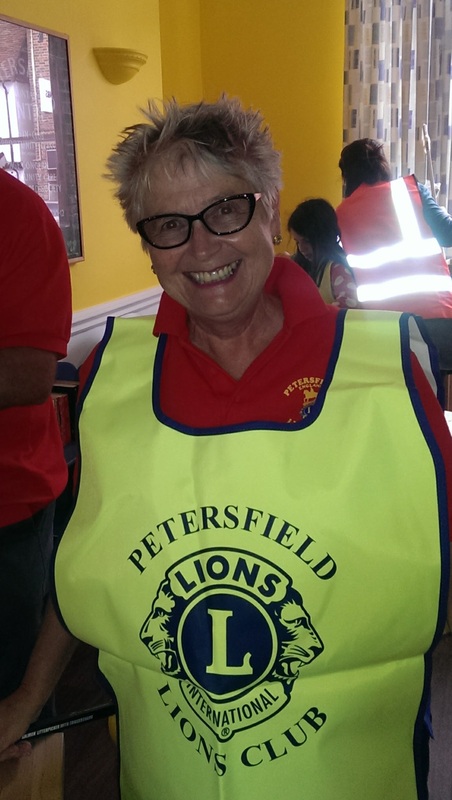 She was accompanied by Petersfield Lion President Sandra Manktelow, Teacher Harriette and mother, Kate. Well done Jemma! 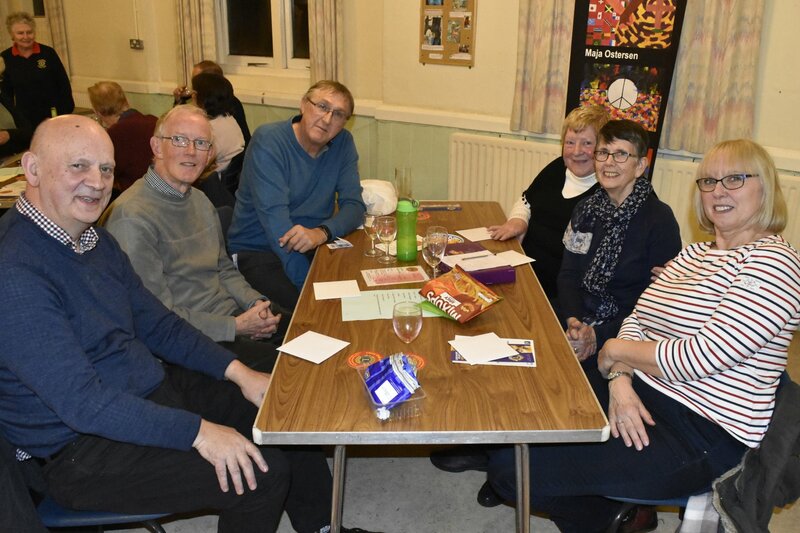 We held a Quiz Night at St Peters Church Hall on Friday 8th March, in aid of Age Concern Luncheon Club. 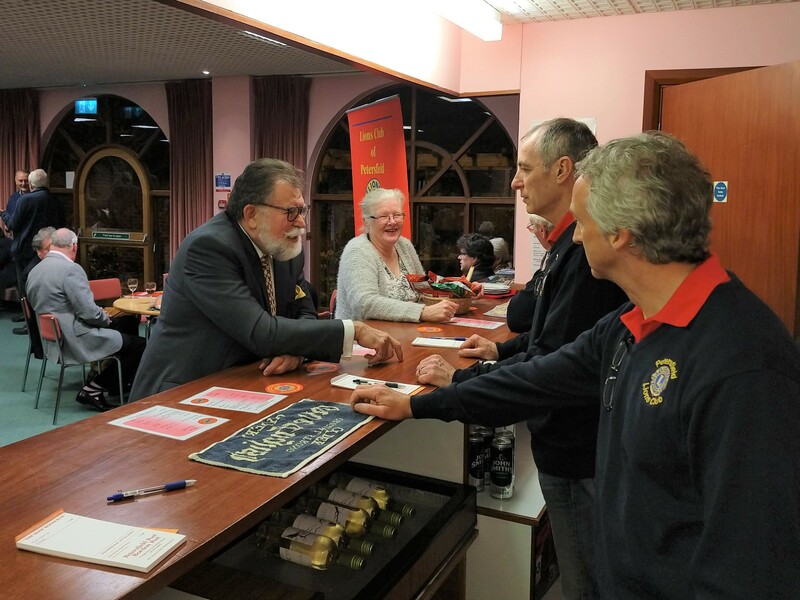 The Petersfield Lions Club (CIO) and the Hampshire Branch of the Prostate Cancer Support Organisation charity (PCaSO) held a blood testing event at Winton House in Petersfield High Street on Saturday 2nd March. 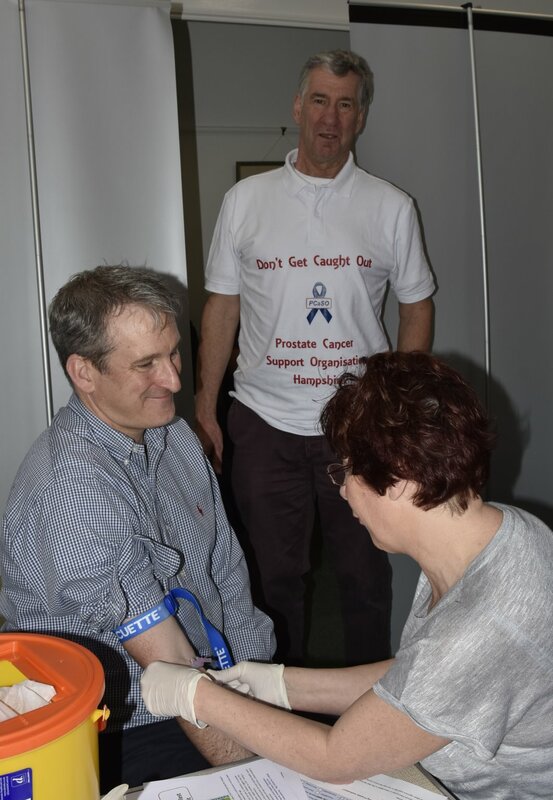 Damien Hinds MP giving a small blood sample for PSA testing, with phlebotomist Marrie Simms and Peter Wier, PCaSO. We held a coffee morning in aid of Headway West Sussex. Headway support people who have survived a brain injury and now face a new future, offering help and advice. 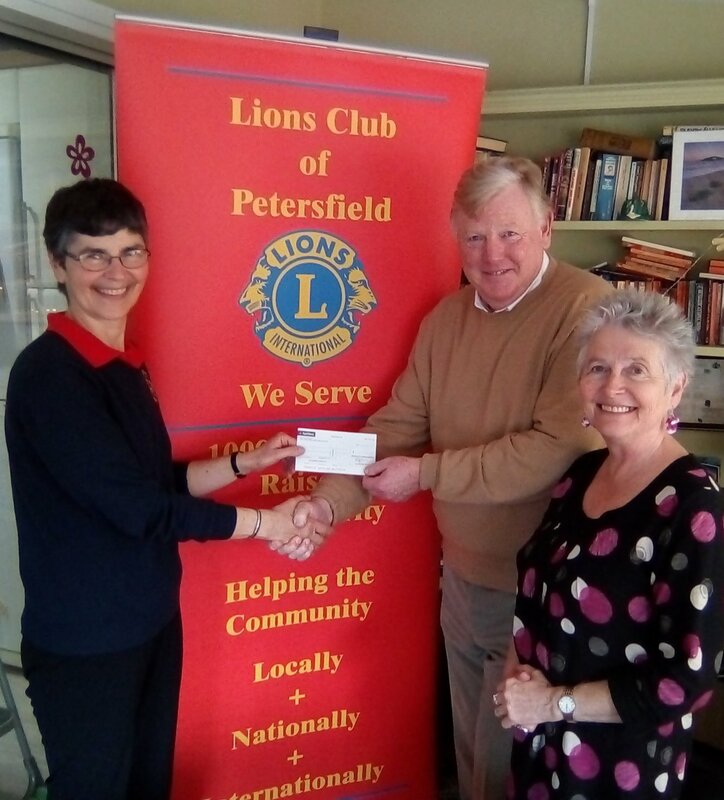 Trevor Hines of Headway gave a short talk about what they do and was presented with a cheque for £250 by Club President Sandra Manktelow and host Vice President Mary Putnam. 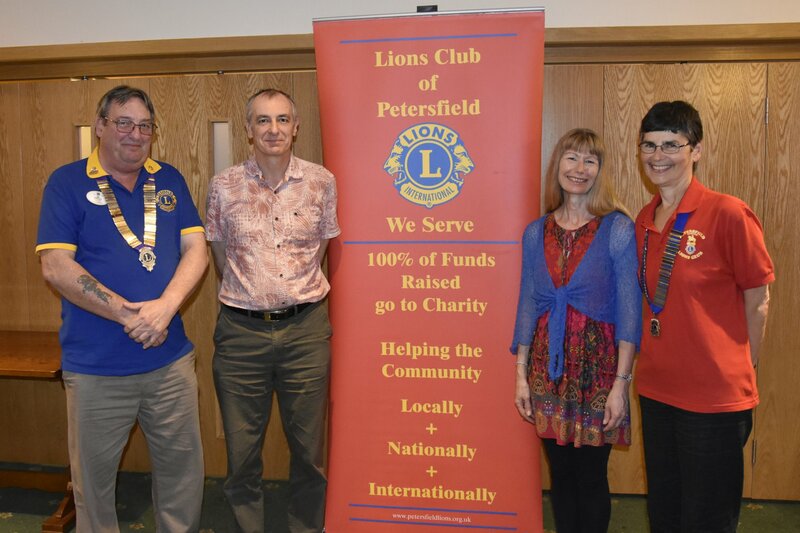 Petersfield Lions Club (CIO) held it's first AGM as a registered charity on Monday 18th February at The Town House. The Trustees presented to the Club and guests, reports on the Clubs Activities and Fundraising for the year 2017-18. Club President Sandra Manktelow also presented 2 cheques for £500 each to Terry Doubleday, Chairman, Butser Home Start and Marion Voller, Chair, PACT Food Bank, from monies raised from our Christmas Envelope, Tesco & High Street collections. 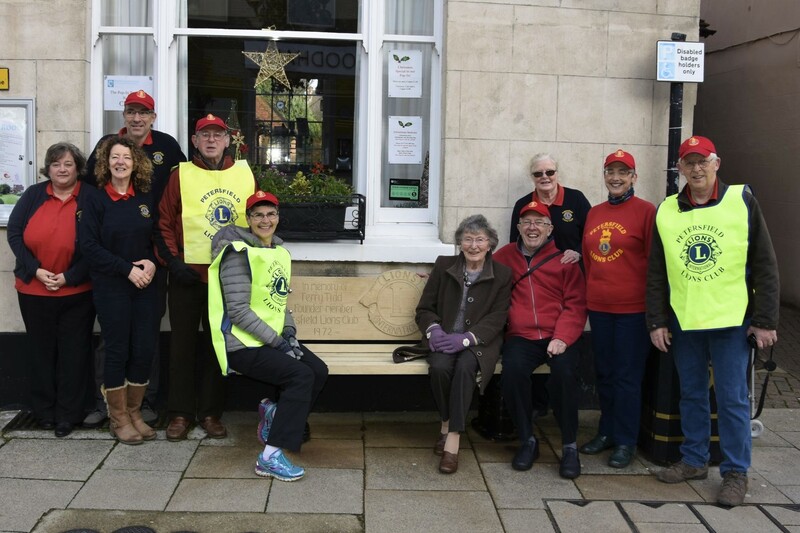 Audrey Tidd unveiled a refurbished bench outside Winton House Centre in memory of her late husband, Terry Tidd on Saturday 22nd December. 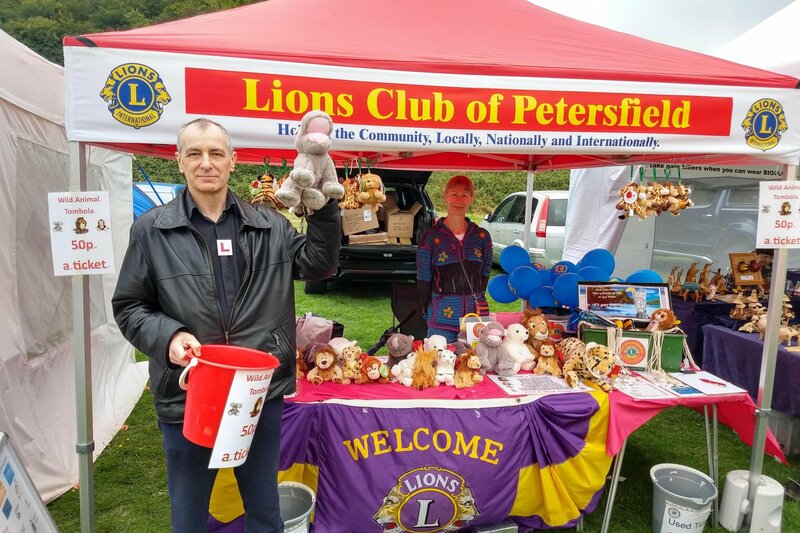 Terry, a founder member of the Petersfield Lions Club, formed in 1972, was a very enthusiastic, dedicated club member and President 3 times. 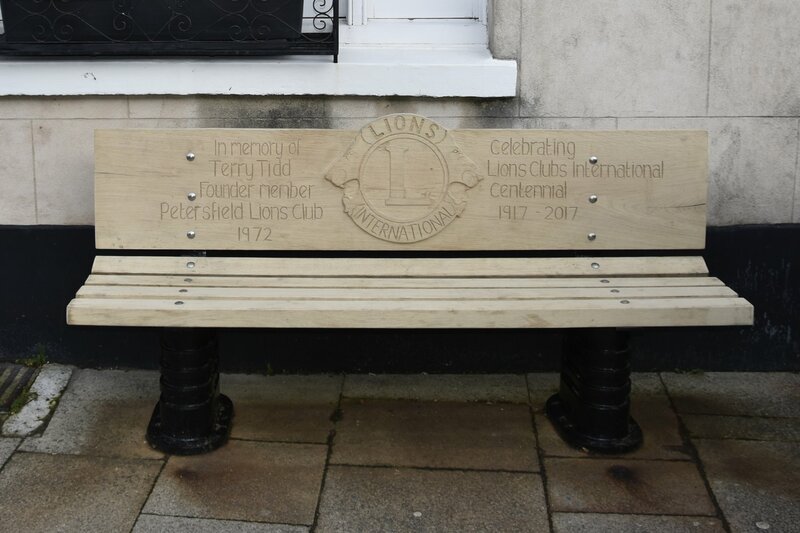 The bench also commemorates the Lions Clubs International Centennial, 1917 to 2017. 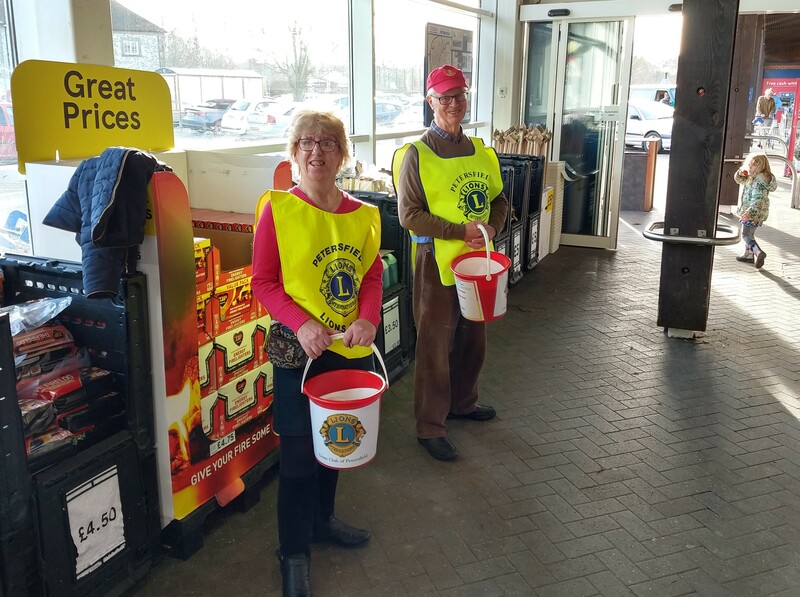 We held our Christmas Street Collections in The High Street and at Tesco's, collecting for this year's Christmas Appeal. Many thanks to the people of Petersfield for your generosity. "Christmas Parcels for the elderly"
"Home-Start Butser", helping families with young children experiencing a crisis this Christmas. We have been distributing envelopes around Petersfield for donations, Gift Aid is also available adding to your donation by 25%. Please return either to Winton House Centre or The Petersfield Post. (We regret Lions will NOT be calling at the door to collect the envelopes). Alternatively you can donate on-line via MyDonate. …with many thanks for your support. 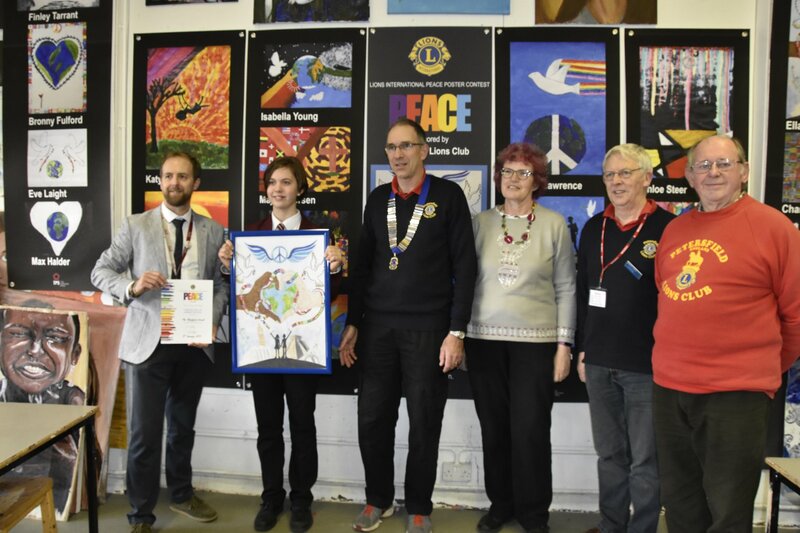 The Petersfield School year 8 Student Jemma Green has won this year's Petersfield Lions Club's Peace Poster Competition. 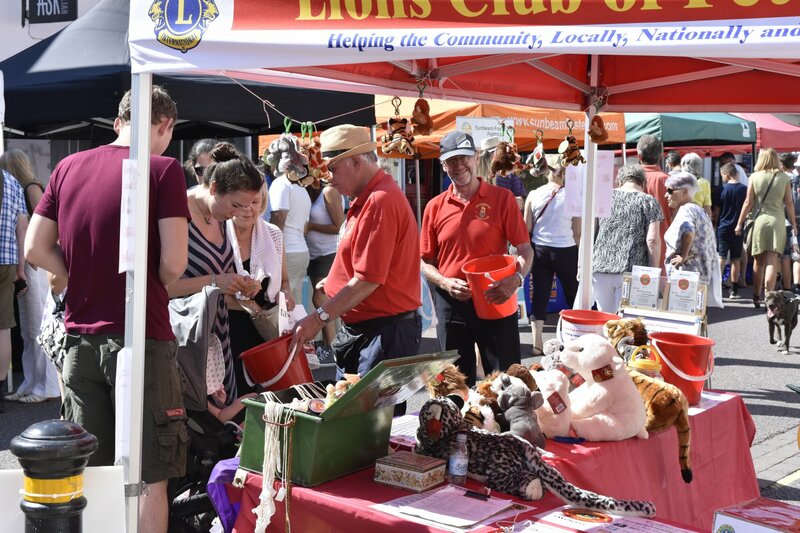 The Competition is run every year by Lions Clubs International and this year's theme was "Kindness matters". It's a way of encouraging young people to think about world peace and their interpretation of this as a piece of artwork. 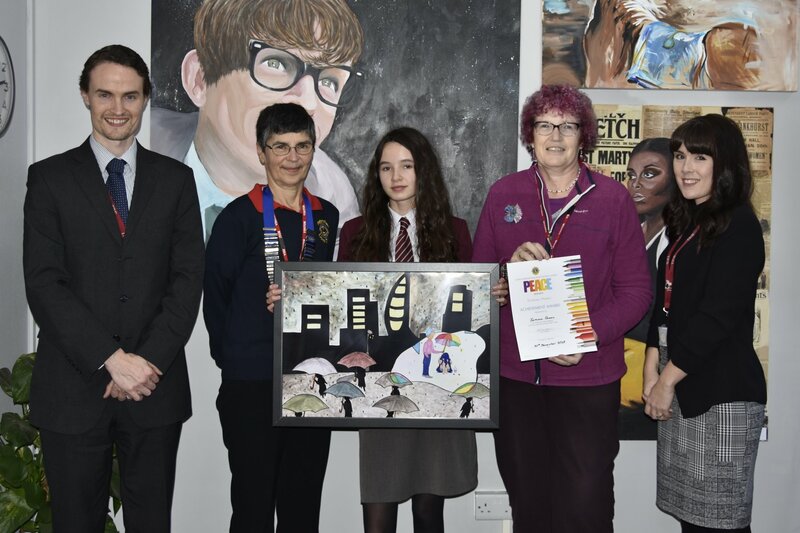 The competition saw some very imaginative and creative entries, but the judges, Petersfield Lions and Caroline Strong, a local Petersfield Artist, felt Jemma's entry best represented the theme of "Kindness Matters". Subsequently, Jemma's picture has also won at the Lions District 105D level and now goes forward to the National competition. Jemma was presented with a Certificate, a Framed Copy of her picture and a £25 book token kindly donated by The Petersfield Bookshop. There is also an Art Exhibition in the Winton House Centre showing the Winning picture and all entries until the new year. 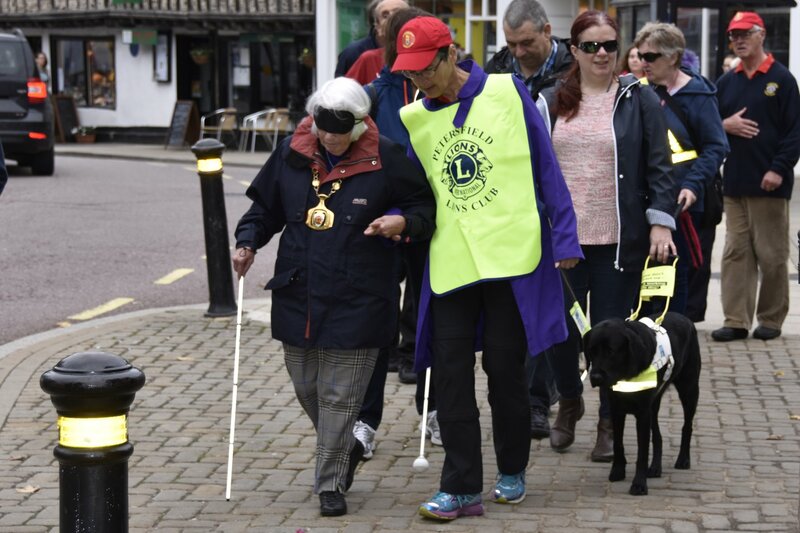 Hilary Ayer, The Petersfield Town Mayor being guided on a Blind Walk by Lion President Sandra Manktelow. 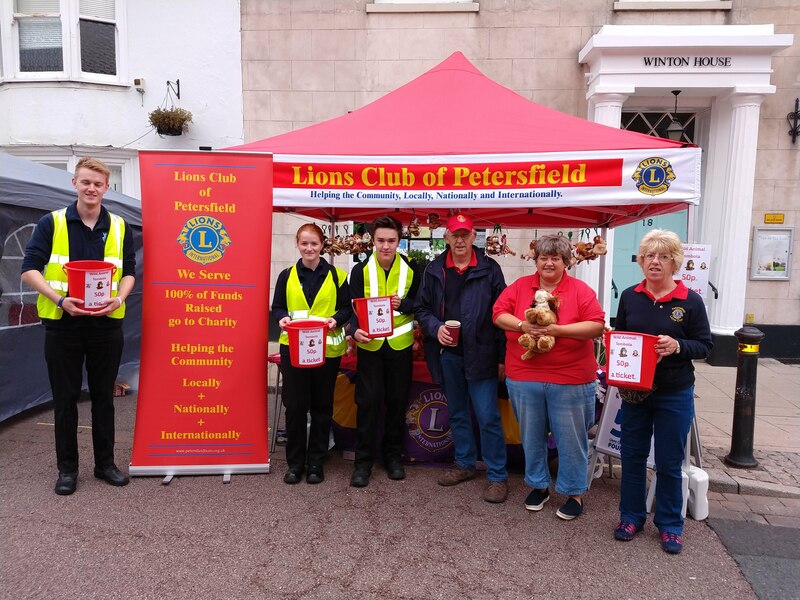 With World Sight Day earlier in the week, Petersfield Lions Club held a Blind Walk on Saturday 13th October, along Petersfield High Street. 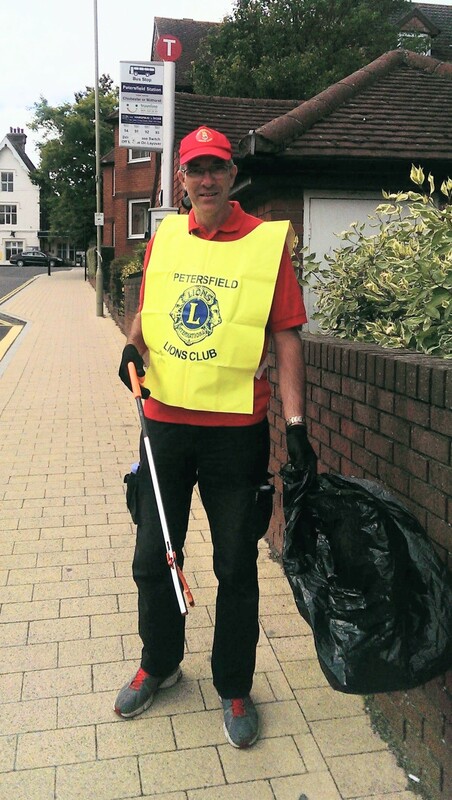 Designed to raise awareness of the problems visually impaired and blind people encounter while walking around town, something a lot of us take for granted and to also highlight the spectacle collection and recycling program that Lions do in Petersfield. 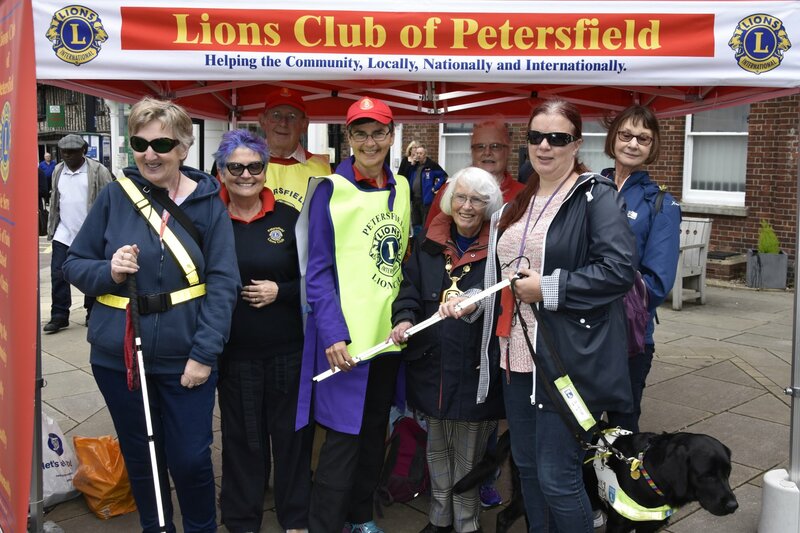 Hilary Ayer, The Petersfield Town Mayor joined Petersfield Lions President Sandra Manktelow, Zoe & Guide Dog "Revel" from Open-Sight and some members from the Solent Active Visually Impaired Working Age Group, for the walk. Afterwards, Hilary Ayer said, "Walking around the centre of Petersfield wearing a black mask and carrying a white stick was a strange experience even with a guide to hang on to. Walking in a straight line was not too bad although I did seem to bear right as I did it. Walking round the Square had me completely disoriented. I thought we were going anti clockwise. Wrong! I also noticed the different textures on the pavement from raised slabs to patterns to the crossing points and then there was the dip at the edge of the Square itself. An interesting short walk and I am so pleased that I have my sight. I really admire those who cope with getting about despite a loss of vision.". Sandra said also "It being an interesting experience - makes us realise how much we take sight for granted. I found the responsibility of leading the mayor around very stressful but it also made me aware of how difficult it must be for the blind and visually impaired to negotiate the many different surfaces and obstacles in Petersfield. Glad to have raised the awareness of World Sight Day to the Petersfield Community especially as Lions are 'Knights of the Blind'. Thank you also to all those who visited our stall to hand in spectacles or find out where to take them." 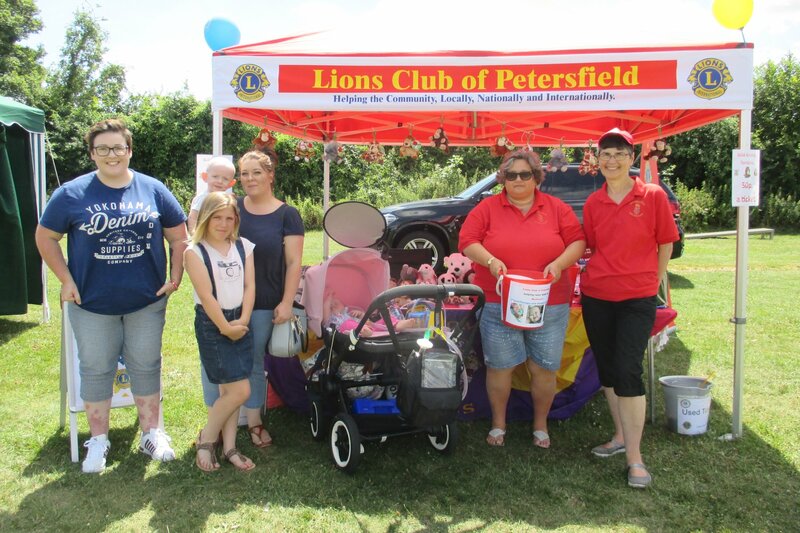 Petersfield Lions Club President, Sandra also presented 10 collapsible White Canes to Zoe & "Revel" from Open-Sight. 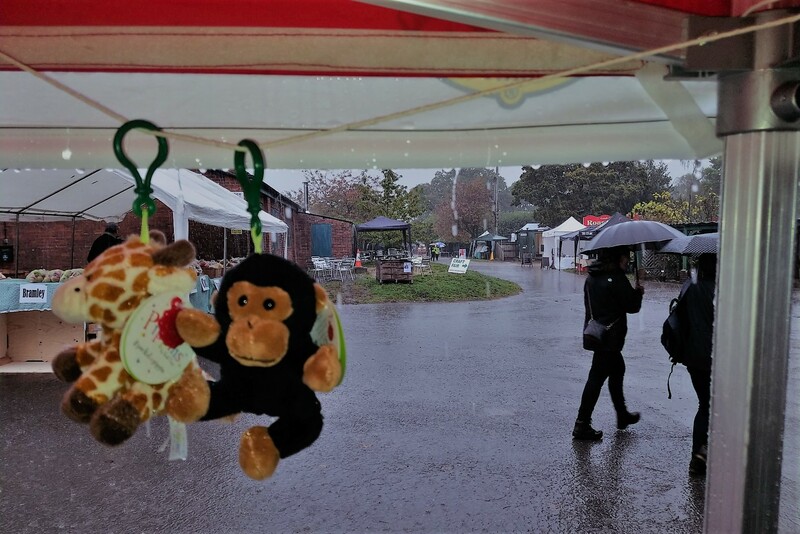 Despite the weather, a surprising number of people ventured out to this years Blackmoor Apple Fair, always a very popular and well organised event, with Apple Tastings, a Craft Fair, stalls and activities. This year 50% of our funds at the stall were going to the Indonesia Tsunami disaster appeal. 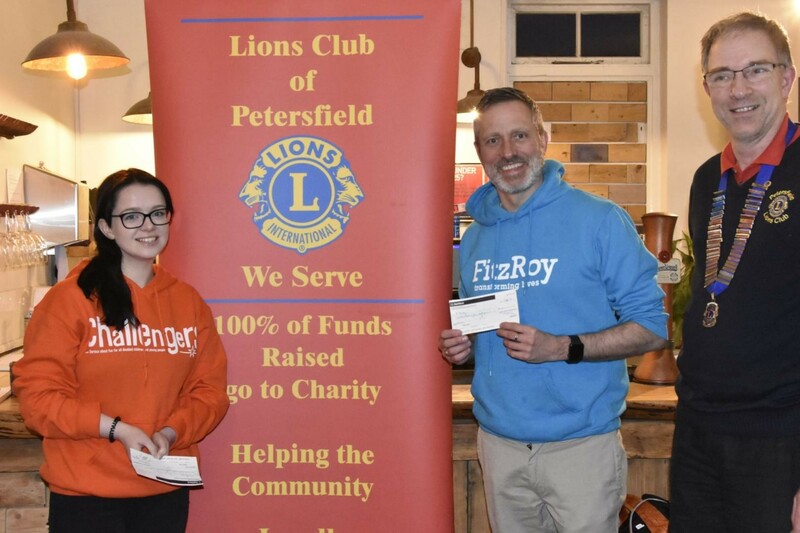 Our recent Quiz Night at St Peters Hall raised over £360 and was won by "The Lifers"
Lion President Sandra presents 2 awards to Nicola Winter, Home-Start Butser & a photo montage to Lion Tony Struthers. 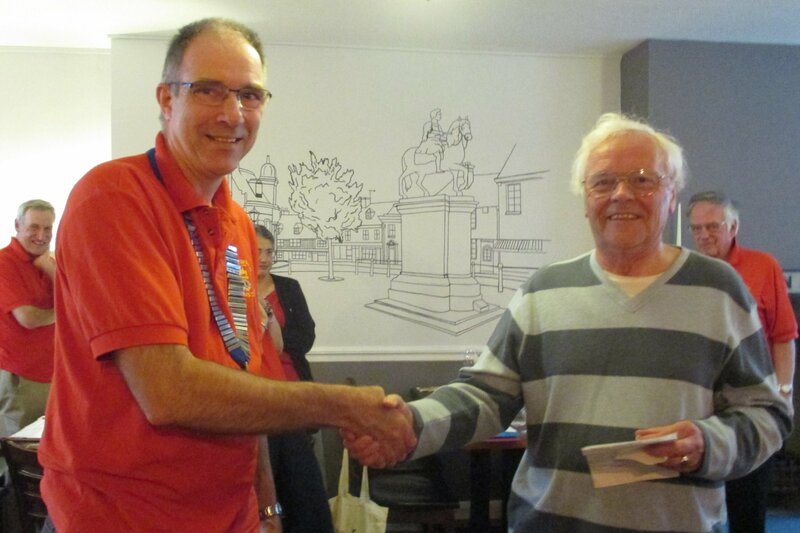 Petersfield Lions Club had an emotional meeting on Monday 1st October at The Half Moon. 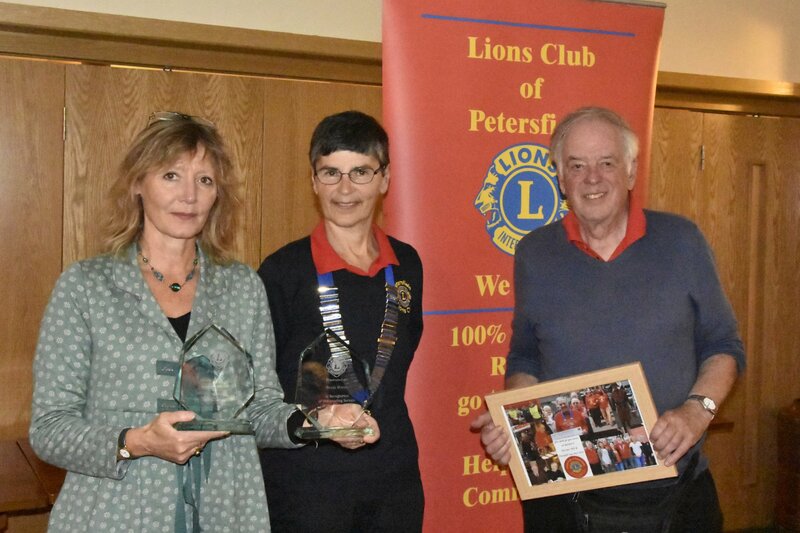 Firstly, as a final part of Lions Centennial celebrations, President Sandra Manktelow presented Nicola Winter and Home-Start two "Lions Community Awards", one for Outstanding Community Service (personal - after 13 years of service) and one in the name of Home-Start Butser in recognition of their Outstanding Contribution to the Local Community. Nicola said she really shouldn’t get any awards for something she loves doing, but that the awards really belong to the Home-Start volunteers who put in so much time and effort and thanked us for all our support and backup for her services, which she really appreciates. 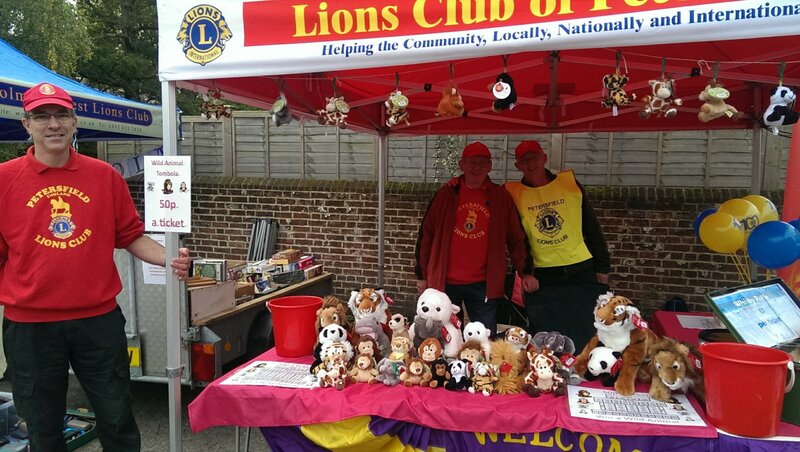 Secondly, due to a house move, we were saying goodbye to Lion Tony Struthers, who has not only been a stalwart member of Petersfield Lions Club for 17 years (and 33 years Lions in the UK) but also a very active member of the Petersfield Community in general. Tony, a retired professional planner, has assisted many community and voluntary groups in East Hampshire over the years, including Petersfield Neighbourhood Plan, Petersfield Town Design Statement and Steep Parish Plan, a former Trustee at Community First East Hampshire and Home-Start Butser, previously Governor Alton Sixth Form College and President of the Petersfield Society, Chair of the Friends of Steep Church, and awarded the Petersfield Town Mayor's Community Award for 2016/7 "in recognition of a valuable contribution to life in Petersfield" in April 2017. 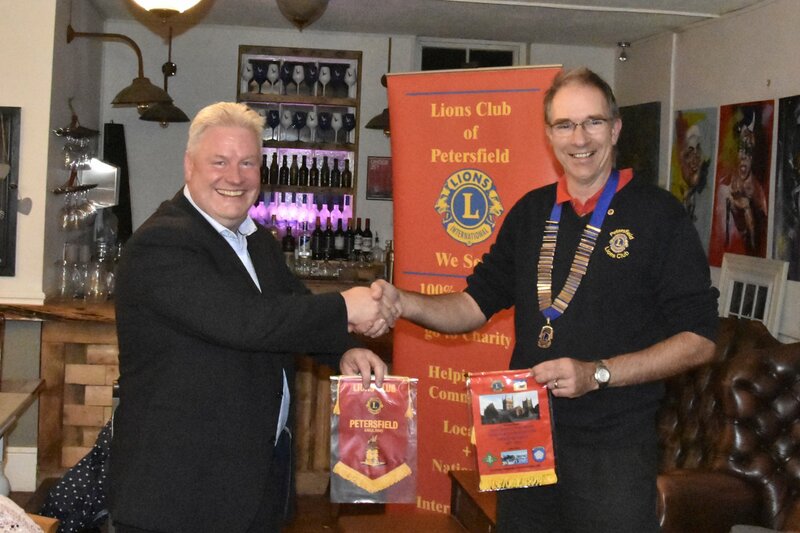 Tony will be sorely missed by us all and was presented with a Photo Montage of his time in Petersfield Lions. We wish Tony & Sylvia well in their new home. At a busy business meeting on Monday 3rd September, we welcomed two new members into the club. Simon & Diana Cole were badged up by Lion President Sandra Manktelow & Clive Midson. 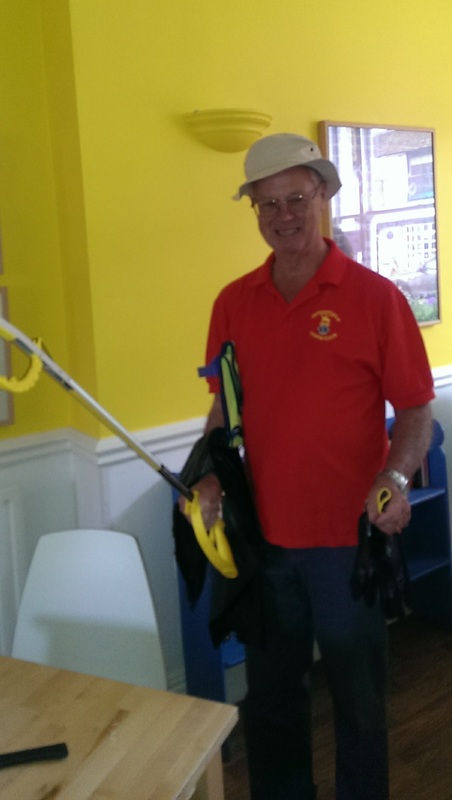 We also had a visit from our 105D District Governor Ken Staniforth. Lions members setting off on a walk round Chidham on a sunny Saturday. Followed by a well deserved lunch at Stansted. 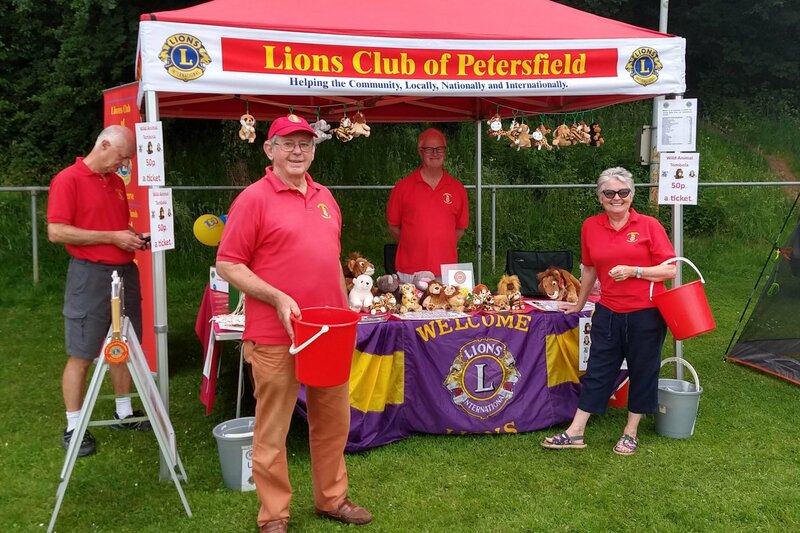 It was a washout at the Petersfield Summer Festival on Sunday 26th August.We had support from the Petersfield Police Cadets setting up our "Toy Tombola" stall, they also helped with the marshalling. Although the weather forecast was not good, we braved it as long as we could, but the wind and heavy rain proved too much, we abandoned the stall. Many thanks to the few brave members of the public who ventured out and supported our stall on the day. We had a busy day at South Downs Country show on Sunday 19th August. Although it was a blustery damp start, the sun and crowds followed latter in the day. We had help also from 2 prospect members. We held our usual Toy Tombola & Gin game stall at this years Clanfield Fete. 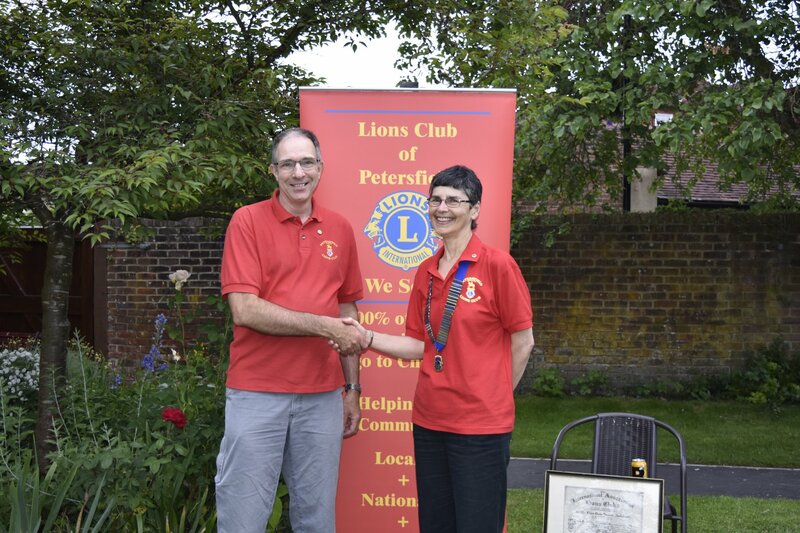 Sandra Manktelow took over as President of Petersfield Lions Club at the Clubs Charter and Changeover BBQ at Winton House on Saturday 23rd June. Outgoing President David Read handed over the Chain of Office and thanked the Club for their support over the past year. 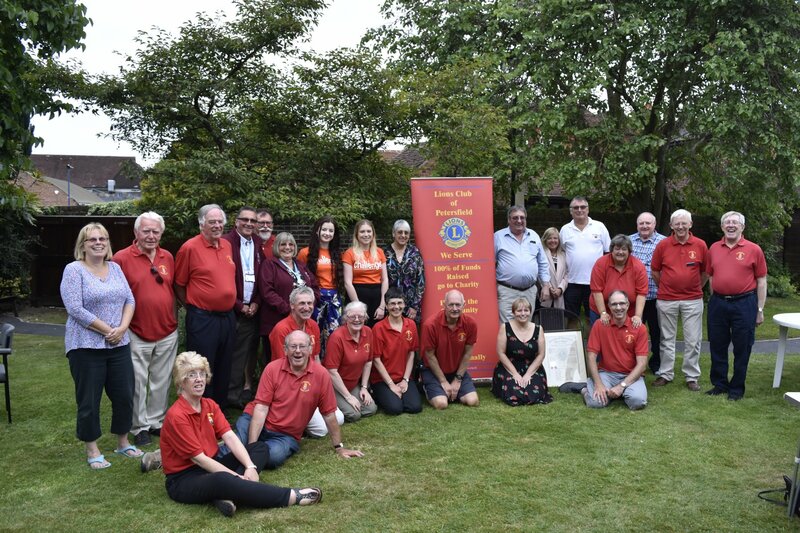 Along with Club members and partners, were guests from some of the good causes the Club has supported over the past year, Challengers, Naomi House & the Petersfield Police Cadets, along with 105D District Governor Peter Burnett & District Governor Elect Ken Stainforth. Sandra presented David with a Scrapbook of his year as President and said she was looking forward to the Year ahead. In the middle of June, we took a mini bus with Families from HomeStart Butser for a day trip to Paultons Park in the New Forest. 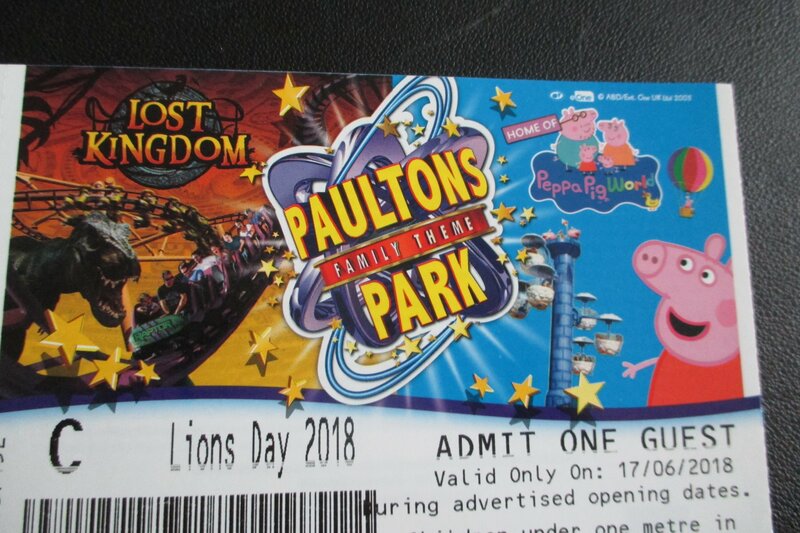 This is a yearly event run by Lions of 105D and allows hundreds of children from families who could not otherwise afford such a day, a very enjoyable day out. We held our Toy Tombola and Gin Game Stall at the Liss Infants School Fete in June. 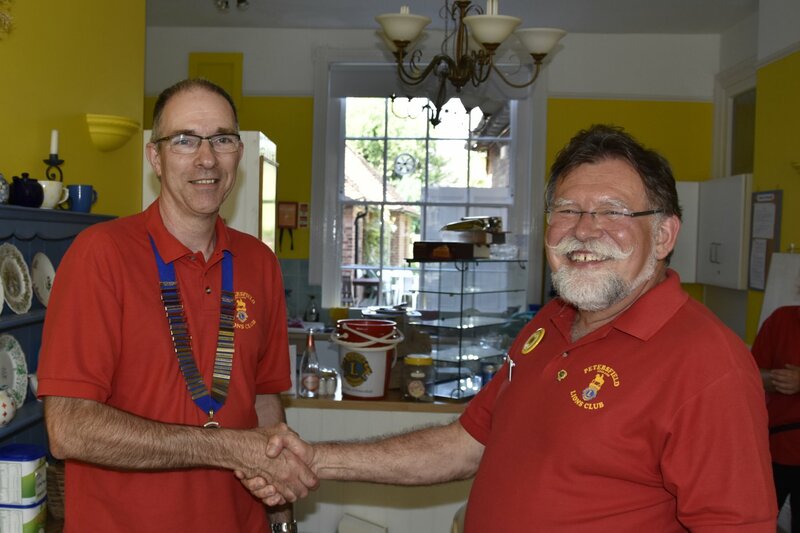 Geoff was welcomed into the Club and badged up as a full Club member at our meeting in June. 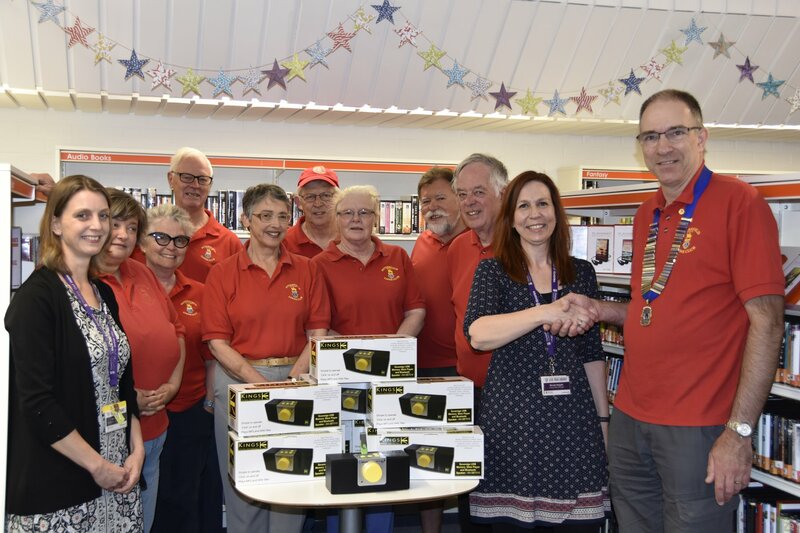 Petersfield Lions Club donated 10 "Boom Boxes" to the Petersfield Library, USB Audio Players that help bring Audio Books to life for people with impaired vision. These small battery powered units allow easy playing of Audio Books and Talking Papers via a pre-loaded USB stick and simple controls. They can be used by anyone with impaired vision, or anyone who finds it difficult to hold or manipulate the pages of a book. 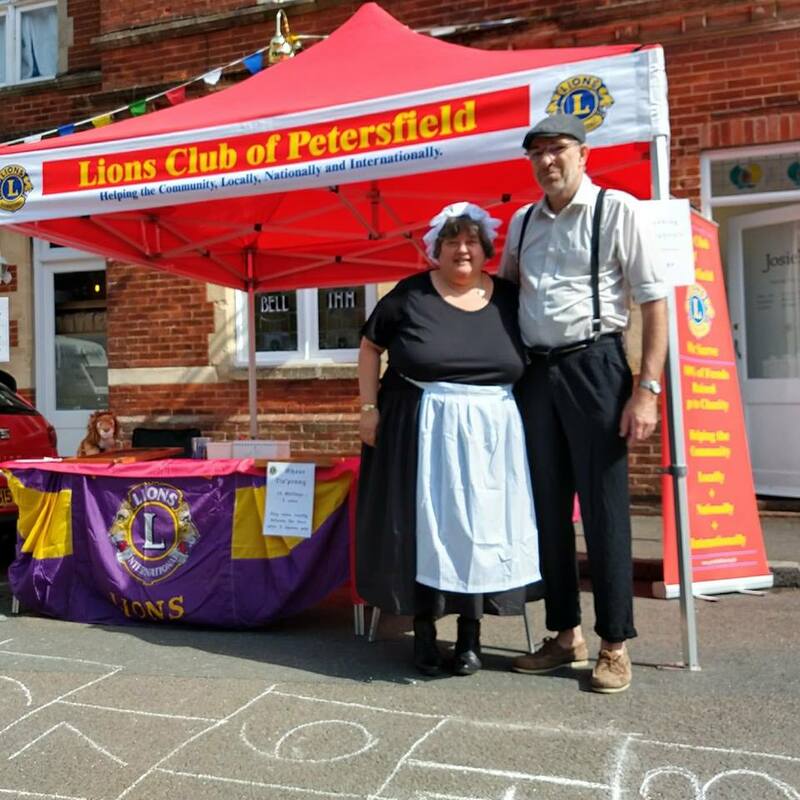 Sunday 13th May saw a good turn out for the Victorian Day, organised by The Petersfield Museum. With period costumes, Bicycles and cars. On our stall we had, Bagatelle, Shove Ha'penny, HopScotch and Bobbing Dougnuts. In recognition of 15 Years of Service to Lions, Mike Piatek and Lin Piatek are presented with their 15 Year Service Chevrons at our Club meeting by Secretary Trevor Copping. 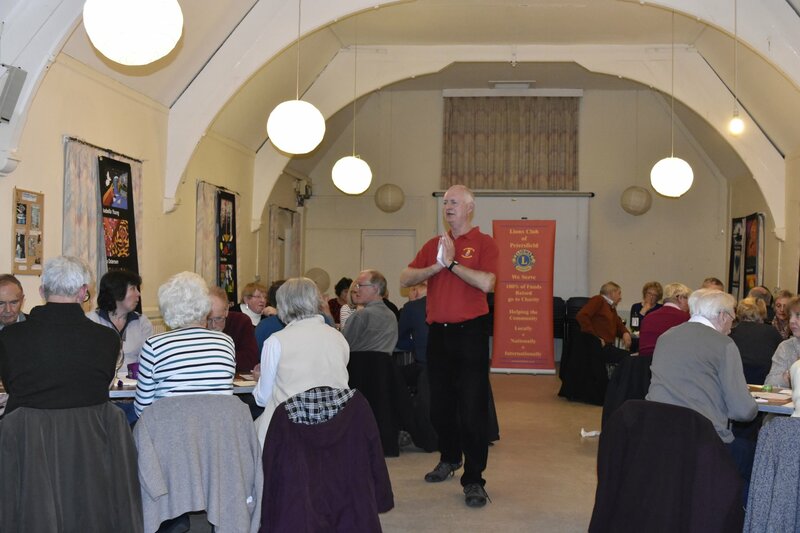 Our First Quiz Night of 2018 on Friday 2nd February, in total raised £369 for Challengers, Home-Start & Fitzroy. The evening saw 6 teams compete, with "Universally Challenged" the ultimate winners. Quiz Master Clive, contemplating a team's answer. 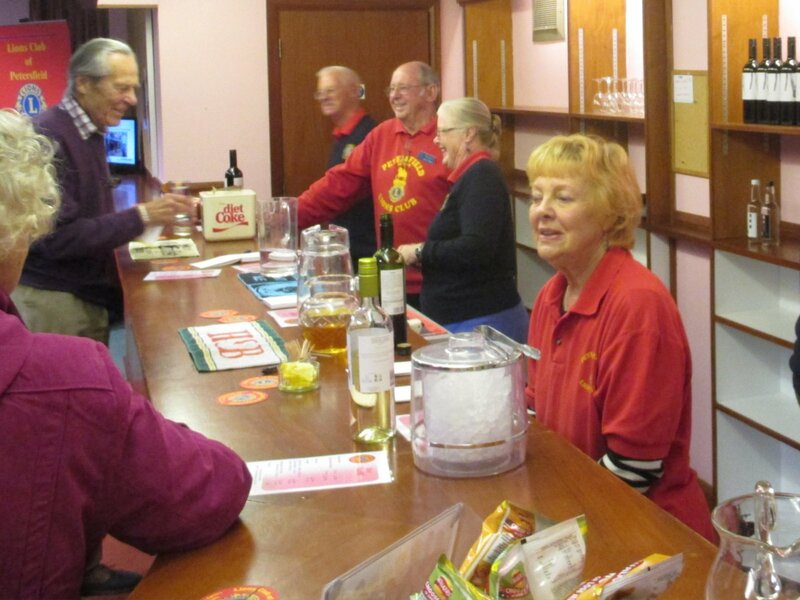 We held a Swishing Party on 12th January, which was well attended and enjoyed by all. This raised over £260 for Naomi House which was presented on the night. We had collections both in the High Street & at Tesco leading up to Christmas. * Help for Home-Start families with young children experiencing a crisis this Christmas. 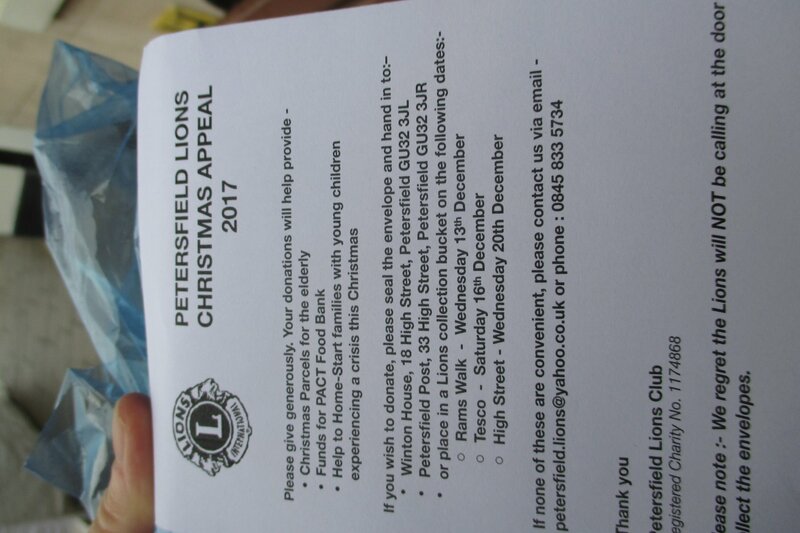 these can be handed into Winton House or handed to a Lion on one of our street collections over the next couple of weeks. 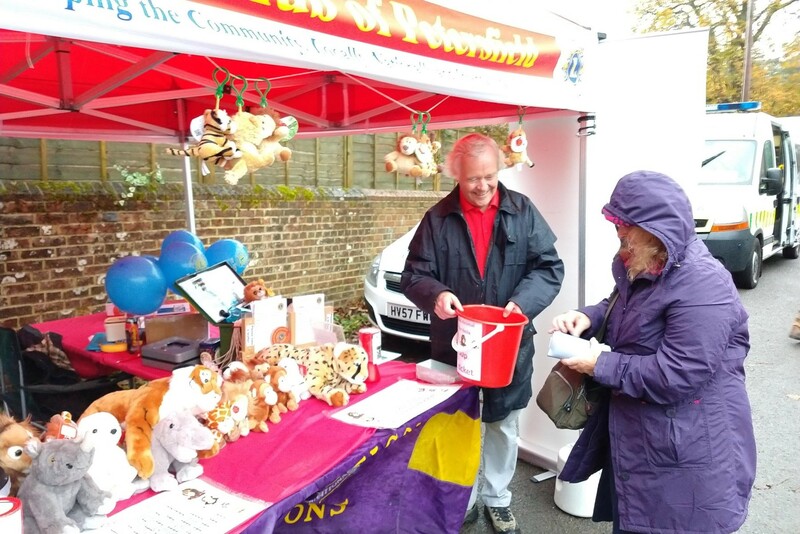 Sunday 3rd December we had our Toy Tombola stall outside Winton House for the Petersfield Christmas Festival. 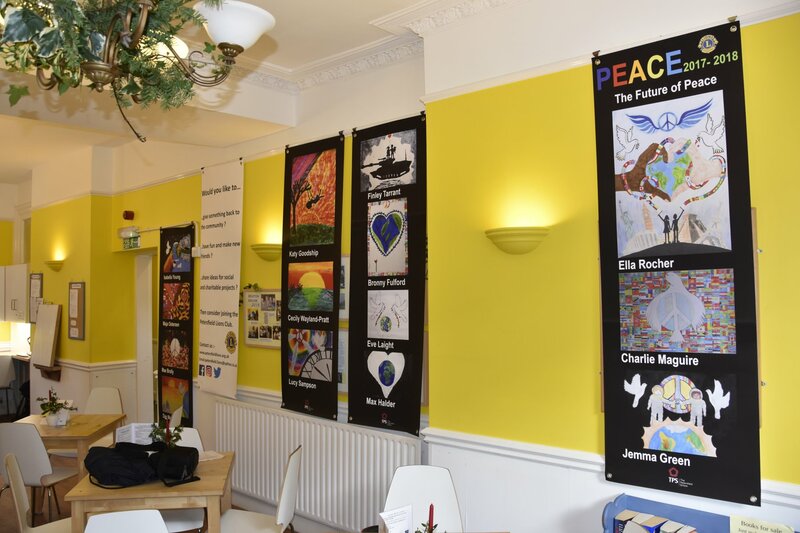 We also arranged an Art Exhibition in Winton House with the runners up and winning entry in this years Peace Poster Competition. 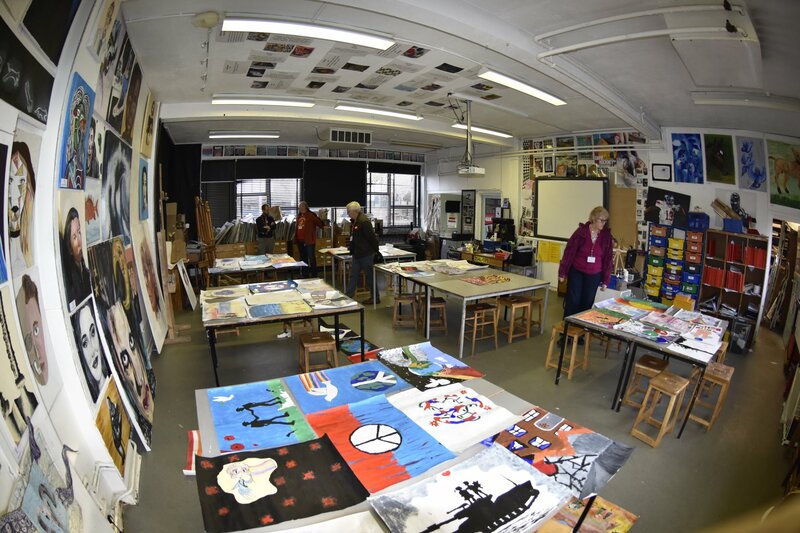 The Art exhibition will continue to be displayed in Winton House until the end of December. 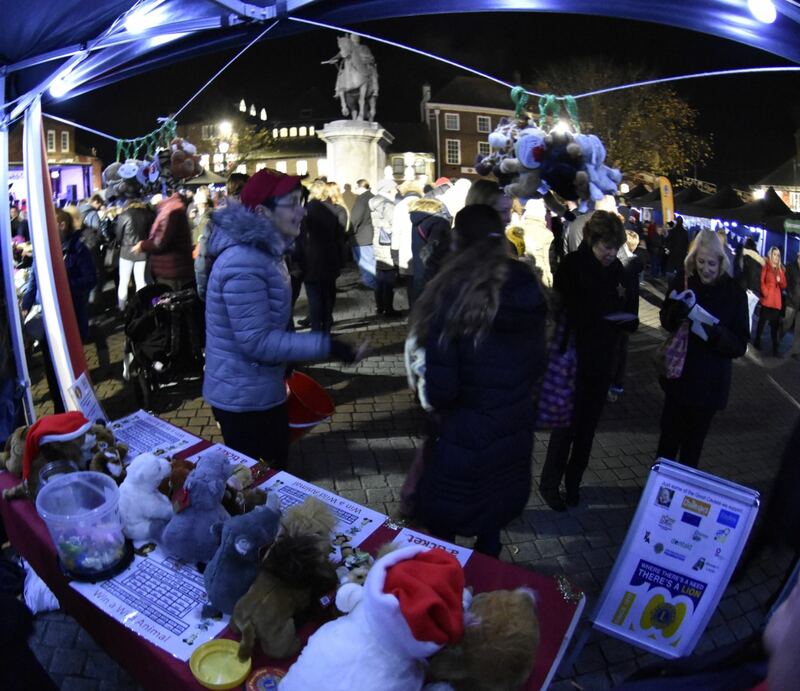 The Petersfield community turned out on Friday 24th November for the Town Center Christmas Lights Switch On organised by the Town Council. We had a small stall in the Market Square, raising funds for Home-Start Butser. Ella Rocha's picture was chosen as the overall winner by the team of Judges. Ella's picture was subsequently entered into the 105D District level of the Competition where it came Second. 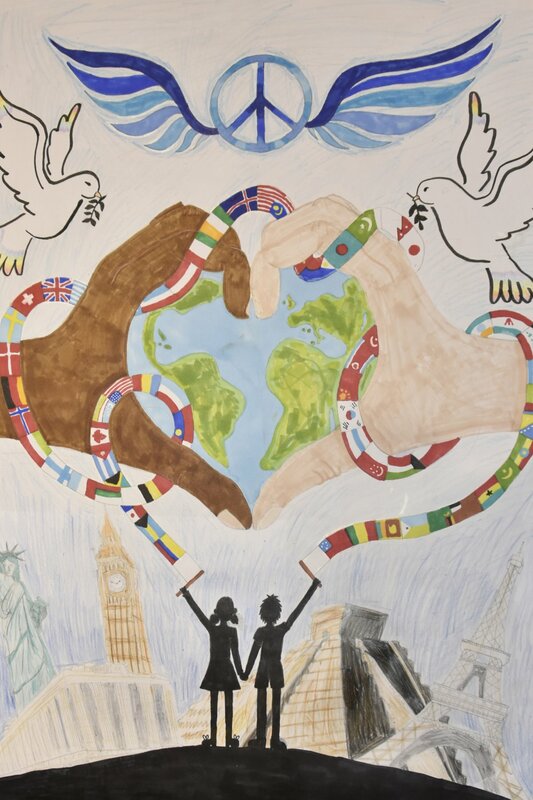 "The Future of Peace" by Ella Rocher, Year 7, TPS. We are pleased to announce that we are repeating the Winter Fuel Project this year, in order to alleviate some of the problems of poorer households in our area. Prior to this year, the scheme has raised £9,440 from the generous pensioners who have donated all or part of their Winter Fuel Payments. Helen Drake, Chief Executive at Citizens Advice East Hampshire has confirmed to us how grateful they are for this initiative. 14 families already this year have been helped. What an incredibly busy day this is. Blackmoor Estate hold an Apple Tasting day in October and we were there again this year with our stall. 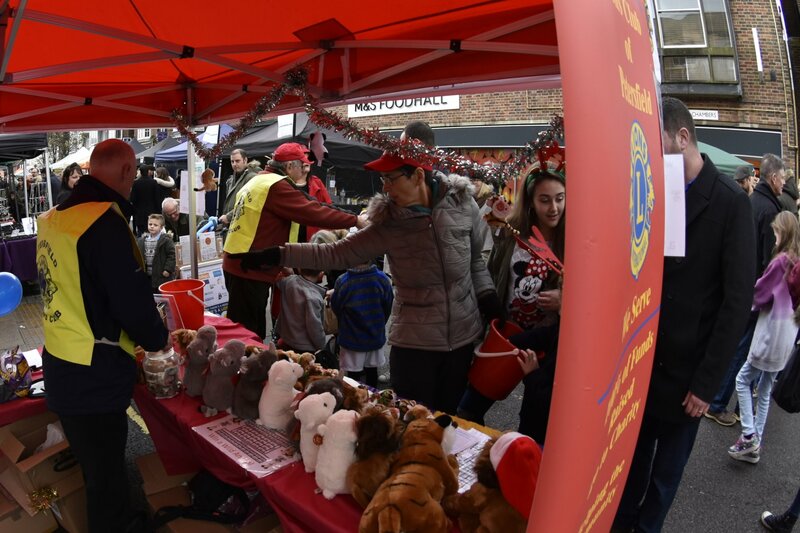 It was busy, busy, busy, from 10am till 4pm when we had "sold out" of all our tombola tickets. We ran the Bar for the "Southern Pro Musica" concert at the Festival Hall. 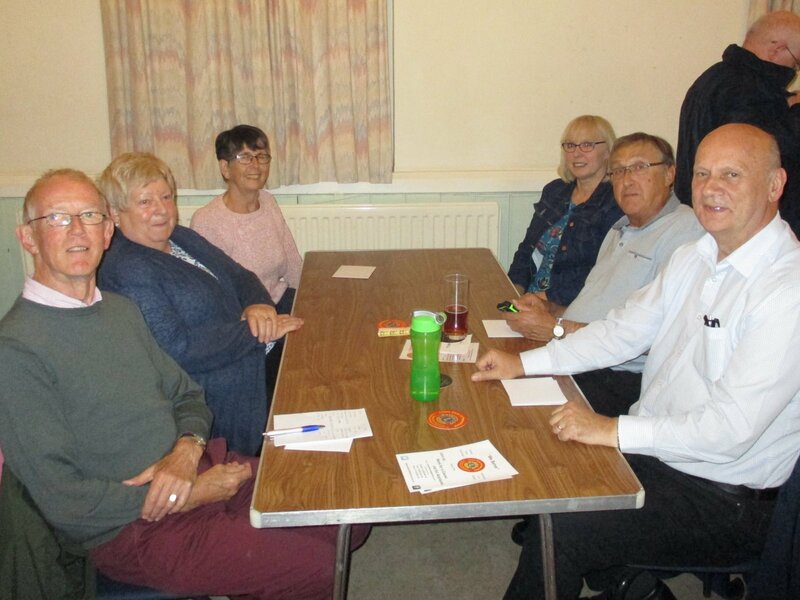 2nd Vice District Governor Jarvis MacDonald visited our Club meeting on Monday 2nd October. 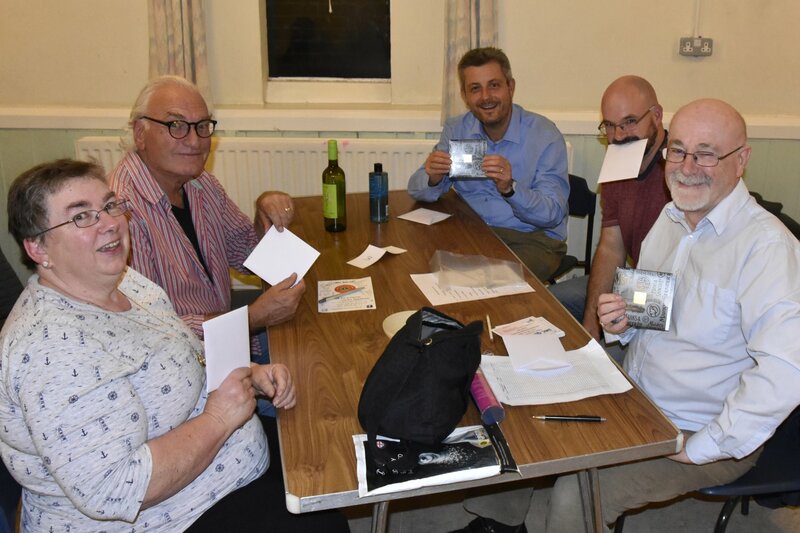 We held a successful quiz night at St Peter's Church Hall on Friday 29th September. With 8 Teams, the ones to come out victorious were Universally Challenged. We raised over £500 in aid of 3 charities, Home-Start Butser, Fitzroy & Challengers. 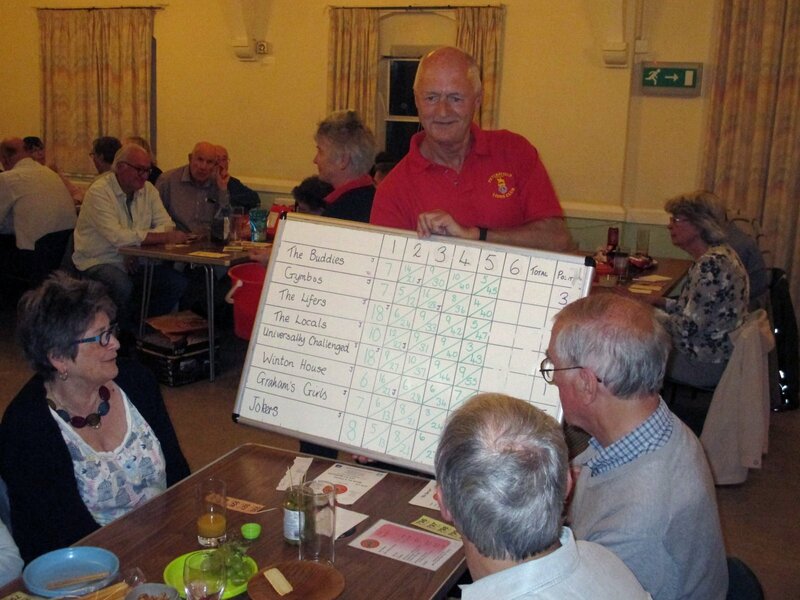 "You might not want to see this", Clive shows the score board before the final round. 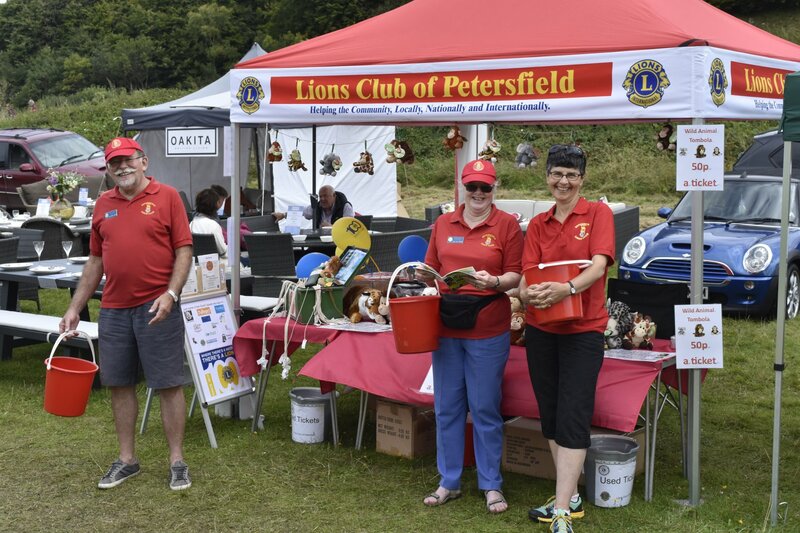 On the Bank Holiday Weekend Sunday we held our Toy Tombola Stall at the Petersfield Festival, with a good turnout and the sun shining, we had lots of lucky winners. 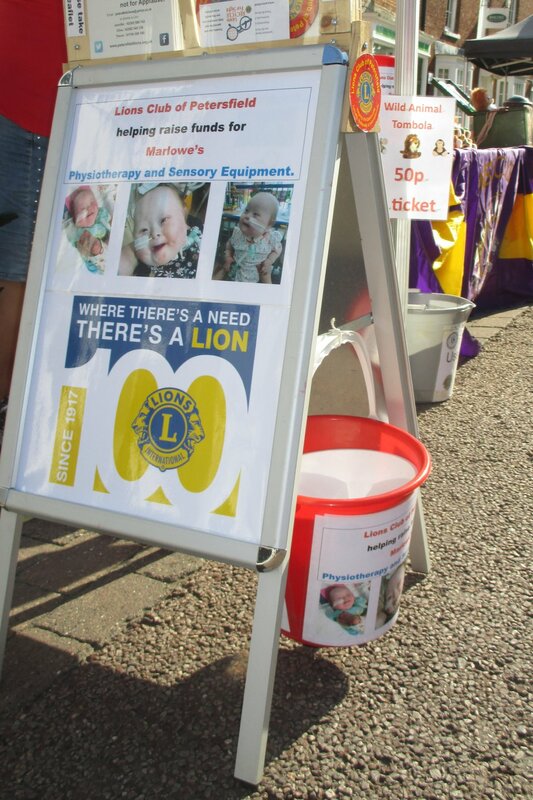 The stall was raising funds for Marlowe's Physiotherapy & Sensory equipment. "Will this ticket be the winning number?" We had a busy day on Sunday 20th August at the South Downs Show, Queen Elizabeth Country Park. In many parts of the world there is little or no access to dental care. A lot of people suffer with the pain and suffering of toothache, abscesses and diseases. Dentaid is a charity dedicated to enabling people from disadvantaged communities around the world to enjoy relief from dental pain and access good oral healthcare. Dentaid supports oral health projects by supplying dental surgery equipment, portable dental equipment especially for rural areas and oral health education resources and training. Lions Clubs suport Dentaid by collecting equipment and fundraising. For the last 20 years Dentaid has been reconditioning and restoring equipment donated by dental practices across the UK and sending it to projects overseas. John from Dentaid and Lion President Dave delivering a collection of X-Ray equipment collected from Dental 66 of Petersfield. 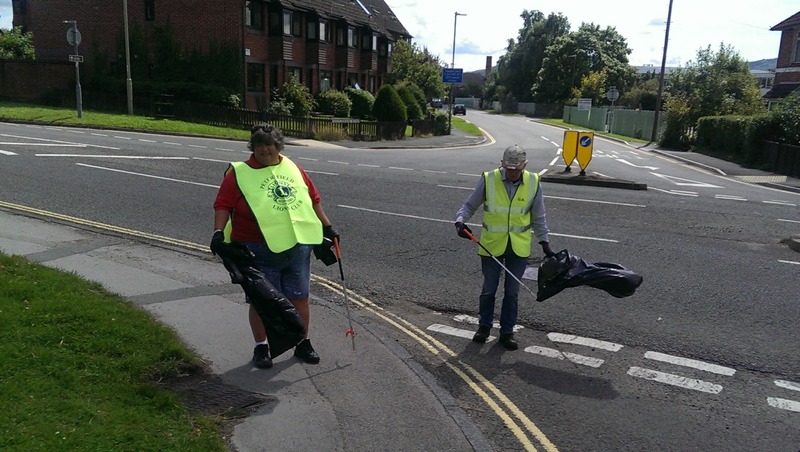 On Sunday 6th August we helped the Petersfield Society with their Litter Pick around Petersfield. 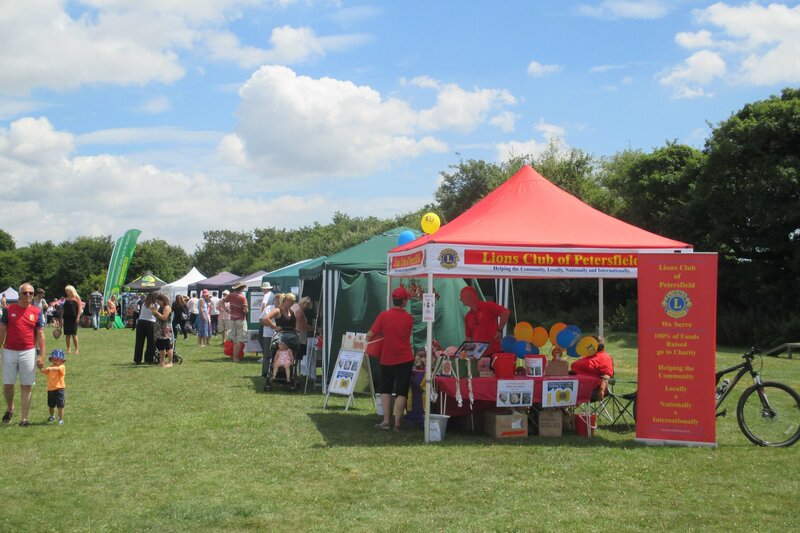 We held a toy Tombola Stall at this years Clanfield Celebrations on Saturday 8th July. This year we were raising money for Marlowe. Marlowe was born in July 2015 with down syndrome and a heart condition. She has been in hospital until now, Team Marlowe are raising funds to allow Marlowe to come home and be with her family, this necessitates a home extension, a sensory/therapy room and additional equipment. Our Club Changeover took place after the Centennial Celebrations at Winton House. Out going President Mike Piatek, handed over the chain of office to incoming President Dave Read. Mike thanked the Club for their support and was presented with a scrapbook of his year in office. 10am - 4pm, High Street. 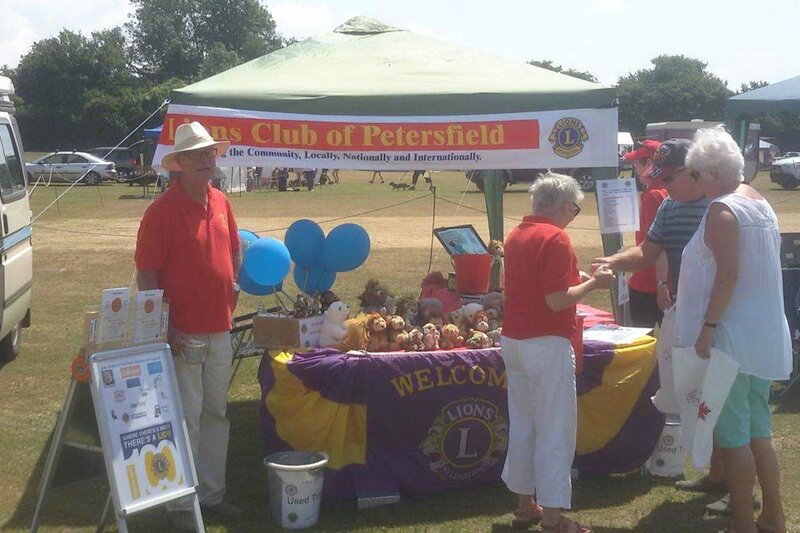 See what's happening in Petersfield right now.